Would you prefer I take my del.icio.us Linkorama out of my RSS feed? Yesterday I ran into Slideshare co-founder and CTO Jonathan Boutelle in the Blogtropolus lounge. He told me about the Denial of Service attacks from China that Techcrunch covered this morning. It aimed to bring down political content through removal and password reset requests by fake users, and then a botnet attack last Thursday and Friday. CNN had a similar attack. It continues now, perhaps after blog coverage, but that shouldn't stop people from raising awareness. Think of it as recruiting a friendly botnet, on a political level. revived across Twitter, Upcoming.org and location webservice Fire Eagle. I'm looking forward to enabling my location and querying find my friends amidst the unwashed web masses at this mega event. Plazes also just launched FireEagle support, letting my location on the network automatically update Fireball. My guess is this if enough people get access to the beta, this could be the app of inflection for Fire Eagle, what SXSW did for Twitter. Randall Stross in the NYTimes writes about how prominent bloggers get overwhelmed by email and how its nothing new. Of course, journalists empathize with this condition, so its perhaps over emphasized at large. But implicit in a lot of conversations I've had lately, we've turned up the noise in our communications and there is a lot of room for innovation in extracting signal and enhancing effectiveness. Randall notes how human proxies in the form of assistants may not be effective. Yes, you can offshore outsource such services at nominal cost these days, but if anything such an assistant should be closer to you than anyone to be effective. And the article does not explore using the social network as a filter, going beyond the single assistant. The article does highlight the practices of H.L. Menchken, known for his effective and illustrious correspondence, who died 50 years ago. Batch processing was easier when everyone was on the same clocks for sending and receiving. 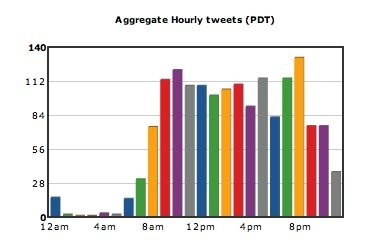 Today most people have a bell curve for their communications, with peak hours generally being when they are awake. And everyone has a different bell curve not to mention different time zones. I think you can work out these protocols with people you regularly communicate. But such people also adapt to you, perhaps your lack of responsiveness and how you react in escalating. But establishing these protocols, across modalities, are the most difficult with the same strangers who could provide the most valuable new information to you. Look Tantek's approach of putting and adapting his protocols on a wiki page. Look at Robert Scoble's difficulty in how he follows everyone who follows him, but then can't get people to respect a protocol of not sending him direct messages in twitter, especially the text messages are expensive when on the road in Israel. Valuing and responding new correspondents, what Menchen called courtesy and we might call quaint, rises in complexity as modalities fragment communication. Some people might wish the same for Jack, Ev and Biz, although an ice wagon is tough to come by these days. These modalities, such a blogs and Twitter, and not to mention more specialized forms such as social bookmarking, feed sharing, Flickr or obnoxious Facebook apps -- all trend towards batch processing. They can almost all flow into an RSS newsreader for a power user. And conversations flow across them and often threads and comments are hard to follow. But that's okay because of informality and discovering what you missed while in the flow is far easier. One key to effectiveness is looking for opportunities for more public conversation to prompt easy group forming and gaining agreement from the group on a more effective set of protocols. Batch processing private correspondence needs more than tools, but practices. We've known for a while now that creating private spaces for collaboration can aid productivity by taking some email out of the inbox. And more recently with wikis and the right practices, groups can agree on protocols to be more effective and adapt them rapidly. To Tim Ferriss' point, this needs discipline, but for the whole group. You can follow people and their more public communications. They will be less formal, often curating information for you while in the flow of their own activity. By pulling their flow at a time convenient for you and publishing not just for them, you gain greater social discovery. As you form more private groups in workspaces, and if you take the time to gain agreement on communication protocols, you can batch process effectively. If either (1) which requires no protocol, or (2) which does, fails to be effective for sender or receiver -- by all means escalate, even at risk of being run over by an ice wagon. 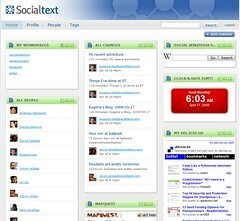 Today Socialtext launched Socialtext People and Socialtext Dashboard, significant enhancements that make people a first class object in the wiki platform and give them greater control over their internal and external information. We also launched Four Solution areas that I've mentioned before, that turn features that demo well into strategic implementations, but they need greater explanation. Networks don't have people. People have networks. The right point of integration is around the individual. Each of us is the center of our own universe. Here's some related Soylent Green. Yesterday I was talking about the US recession with my boss, Eugene Lee. Our best customers are looking at the downturn as an opportunity. A chance to optimize, innovate, adapt and seize new opportunities. But this isn't the case for most of corporate America. Eugene shared an interesting insight about the role of the edge of and organization and how its at risk in turbulent times. The edge of the organization is the source of innovation and growth. Its also where an organization can sense and respond to change. Ironically, during a downturn, organizations often shave the edge of vital people and resources. And the strains to do more with less hampers communication between the edge and the center, just when the center is making its most vital decisions. And, of course, the paragraph at the end. Otherwise known as cluetrain. Markets are conversations. Relationship before conversation before transaction. Just as new solutions are emerging to enable effectiveness for the edge, it may be more critical than ever. 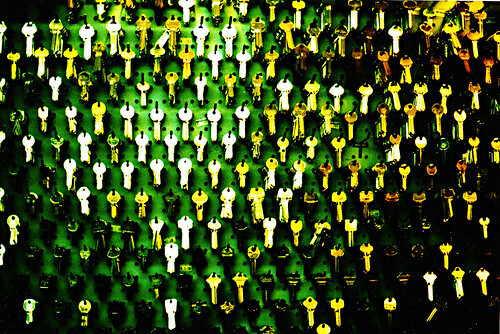 Steve Lohr posts Enterprise 2.0: A Security Nightmare on the NY Times Bits blog. Its the kind of fear sells story that is inevitable. There are apps happenging outside your firewall. P2P, unauthorized-by-the-enterprise proxies, YouTube and Google Apps. Underwritten by a firewall 2.0 vendor, they slap the broadest popular monkier on it, Enterprise 2.0, and lo, profit. Every Enterprise 2.0 firm worth their salt has on-site deployment options. Some like Socialtext have appliances, which give you behind the firewall benefits of SaaS. Not everything attributed as a threat in this piece is Enterprise 2.0. It lumps everything on the web in one bag. And the more enterprises shun the outside in turbulent times, the less they will adapt to survive it. While meeting security requirements is a reasonable part of doing business in this sector, illusions of control do little but erect barriers to collaboration. Last time the economy was in a downturn, further muddied by fog of real war, it was a Fear Economy, with vendors only highlighting risk with claims to manage it. I think we are there again now in popular consciousness, but it is not the case that threat levels have escalated beyond our usual advancing of good policy and practice. There is a lot more to be said. There are a lot of quotes about fear and how a person or society deals with it by far wiser men than me. Recall them, because they are unforgettable.